Many researchers are studying fish oil and cancer... and they have found something fantastic! Not only is fish oil beneficial for those who have already been diagnosed, but the latest research also shows that fish oil supplements can reduce the risk of cancer in healthy people. 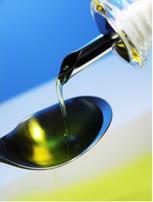 Fish oil supplementation may reduce risks of cancer. I can not say it enough: All fats are not the same, and all fats are not evil. True, the incidence of breast cancer, colon cancer, pancreatic cancer and prostate cancer is higher when fat consumption is high. But, don't miss one important detail! Diets rich in monounsaturated fats (like olive oil), and omega-3 fatty acids (like those from fish oil or flaxseed oil), are associated with a lower risk of breast, prostate, kidney and colorectal cancers. In several studies, a high concentration of omega-3 fatty acids in a person's blood cells meant a reduced risk for developing breast and colorectal cancer. In animal research, omega-3 fatty acids blocked the ability of a toxin to induce tumors by increasing the natural death cycle of tumor cells, and driving tumor cells to become distinct useful cells. DHA reduced tumor formation in animals that were injected with brain tumors. The Inuit (Eskimo) population, which consumes large quantities of oily fish, has a dramatically lower incidence of childhood cancers. Childhood brain cancers are ten times less likely in that group. Taken together, these studies on fish oil and cancer provide valuable insight into the potential protective effects of fish oil! The VITamin D and OmegA-3 Trail (VITAL) is currently underway, which will follow a multi-ethnic population of 20,000 people over 5 years. Participants will take 1gram of fish oil supplements daily. Blood tests, diagnoses, and questionnaires will be used to assess the effects of fish oil supplementation on cancer risk. This study will be critically important to understand the relationship between fish oil and cancer – and specifically, any potential protective effects of fish oil supplements. What if you already have a cancer diagnosis? Other experiments on fish oil and cancer have studied animals and humans who already have the disease, and the potential benefits of fish oil supplements are stacking up. improve appetite, decrease weight loss, increase lean body mass, and/or improve quality of life. It is encouraging that positive results have been shown across a wide spectrum of research models: studying different cancer types, using animals, observing humans, analyzing cells growing on a dish, and treating with different fish oil dosages. It is also worth noting that many results are similar across different cancer types. In addition, the side effects of fish oil are mild and rare. Both of these traits of fish oil and cancer are in stark contrast to chemotherapeutic agents. From this stack of experimental evidence on fish oil and cancer, you would expect that fish oil supplements would be prescribed not only upon cancer diagnosis, but also upon realization of increased cancer risk. Typically, they are not. What do you think about making a "greater effort" in nutritional support? Be sure to leave your comment below. For more basic information on the function of omega-3 fatty acids, how to choose a fish oil supplement, how much to take, and potential side-effects, please visit our article on the benefits of fish oil supplements. Chen Y, BL Liu, AS Chen, SQ Liu, W Sun, HZ Yin, JQ Yin, Q Su. “Nutrition support in surgical patients with colorectal cancer.” World J Gastroent. 2011;17(13): 1779-1786. Fetterman JW, MM Zdanowicz. "Therapeutic potential of n-3 polyunsaturated fatty acids in disease." Am J Health-Syst Pharm. 2009;66:1169-1179. Gleissman H, JI Johnsen, P Kogner. “Omega-3 fatty acids in cancer, the protectors of good and the killers of evil.” Exp Cell Res. 2010; 316:1365-1373. Hegde S, N Kaushal, KC Ravindra, C Chiarp, KT Hafer, UH Gandhi, JT Thompson, JP Vanden Heuvel, MJ Kennett, P Hankey, RF Paulson, KS Prabhu. “Delta-12-prostaglandin J-3, an omega-3 fatty acid-derived metabolite, selectively ablates leukemia stem cells in mice.” Blood. 2011; Epub ahead of print. Riediger ND, RA Othman, M Suh, MH Moghhadasian. "A systemic review of the roles of n-3 fatty acids in health and disease." J Am Dietetic Assoc. 2009;109(4):668-679. Spencer L, C Mann, M Metcalfe, M Webb, C Pollard, D Spencer, D Berry, W Steward, A Dennison. “The effect of omega-3 FAs on tumor angiogenesis and their therapeutic potential.” Eur J Cancer. 2009; 45: 2077-2086. Sinead L, RP Ross, C Stanton. “Marine bioactives as functional food ingredients: potential to reduce the incidence of chronic diseases.” Mar Drugs. 2011; 9:1056-1100.